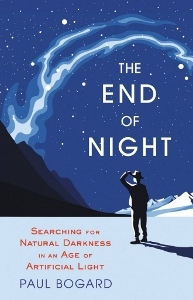 The End of Night is a fascinating and necessary book about the effect of light pollution both on the environment and on ourselves. Light Pollution, for those unfamiliar with the term, is “excessive, misdirected, or obtrusive artificial light”. Both the collective light that keeps you from seeing the stars at night and the individual light that your neighbor shines right into your bedroom window are forms of light pollution. Light pollution can misdirect migrating species, send sea turtle hatchlings into town instead of out to sea by outshining the moon, interrupt human sleep patterns, and even cause cancer. All of this and more is covered in the book. What I liked most about it though was its accessibility. The author’s target audience is the general public: the people who like to camp out and see the stars, who work the night shift and wonder why it’s so hard, the people who have lights shining into their backyard almost bright enough to read by. You don’t have to know anything about astronomy or urban planning to enjoy or benefit from reading it. And there is lots to learn. For example, bad street lighting at night can actually help criminals hide or plan crimes, instead of hindering them and gas stations are lit 20 times brighter today than they were 20 years ago. And while it discusses the United States, it is not entirely US-centric, with chapters discussing such far flung locations as Canada, France, and the Canary Islands. Highly recommended for those looking for good, readable non-fiction, especially for those wondering where the stars went. It’s a excellent read.